Harness the power of light! The 6-in-1 Educational Solar Kit has 21 snap together parts that allow builders to create a car, puppy, swamp boat, windmill or two different airplanes. The parts of this kit can be disassembled and reconfigured to make any of the six choices again and again. 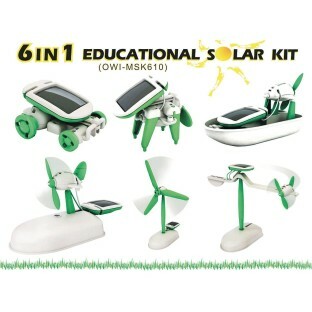 Cited as one of Dr. Toy's 10 Best Educational Products as well as one of 100 Best Children's Products.